A while back a buddy asked me about dynamo systems, as he had just signed up for the Japanese Odyssey rando/bike-packing event and was considering one. 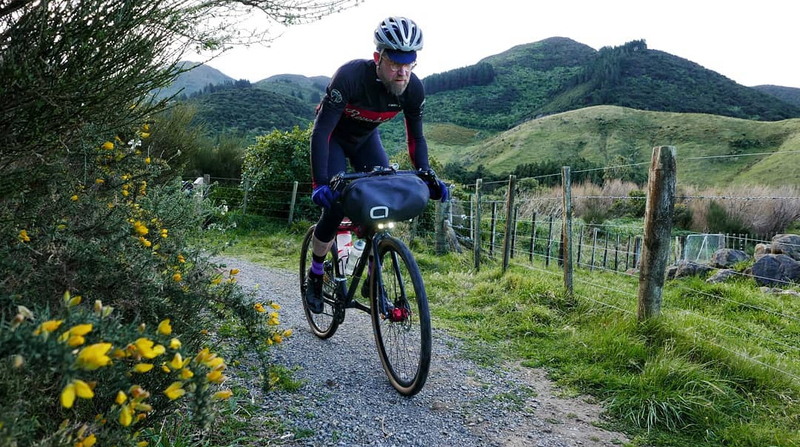 I'd been using an Exposure/SP dynamo kit after an impulse buy in the lead-in to the 2016 Tour Aotearoa, and I have been very happy with it to date. Kerry has to be the most wired guy on the planet, and replies to most emails faster than an army of Russian bots. I had never actually bought a system off Kerry before, but I had certainly benefited a lot from his know-how, and I had a couple of his switch/wiring looms which he built me for my lighting kit in 2015. His knowledge is encyclopedic, especially in how dynamo set-ups relate to Bikepacking, GPSes, cache batteries and the many different scenarios brain addled endurance athletes and Bikepackers find themselves in. The Tour Divide is the proving ground for Kerry's designs and at some stage most of the big hitters have used his distinctive little gold coloured lamps . So I sent off a list of about 6 good questions that would set my buddy Matt up with some guidelines when Kerry replied. To my surprise, within a minute or two I got a voice call via FB messenger, it was Kerry. Switch, light and USB converter for charging devices. Kerry is a master of the 3d printer so he uses this technique as a way of constantly refining his designs in real time. He can adjust his model and print out a tweaked version. He had also been working on a brand new USB charger. 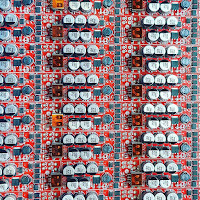 People wanting to use their dynamos for charging devices, (other than their lights) need a USB charger, and most people were having to shell out for the Sinewave Revolution model which seemed to have the bikepacking market sewn up, but was also very expensive, for people not earning US dollars. Anyone, like me, who had tried to build their own USB converters soon realised that the Sinewave was the best option back in 2015. When the kit Kerry sent over arrived it included the new funky USB charger, the Ultra MTB Bikepacker version of the lights, a switch/wiring loom and some extensive mounting options. 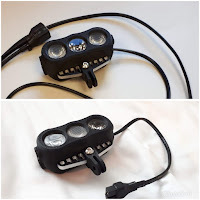 I couldn't wait to get it set up on my bike and test it up against my existing Exposure Revolution Dynamo light, before passing it on to Matt to try. Loads, on GPS top, Phone below. It took me a while to figure out something about the new switch/wiring loom Kerry sent over. (I hadn't read the instructions). It was a "PRO system" only available to the big guns. When it runs on lights mode, it also lets the other plug in the harness charge your GPS, if it is plugged in. 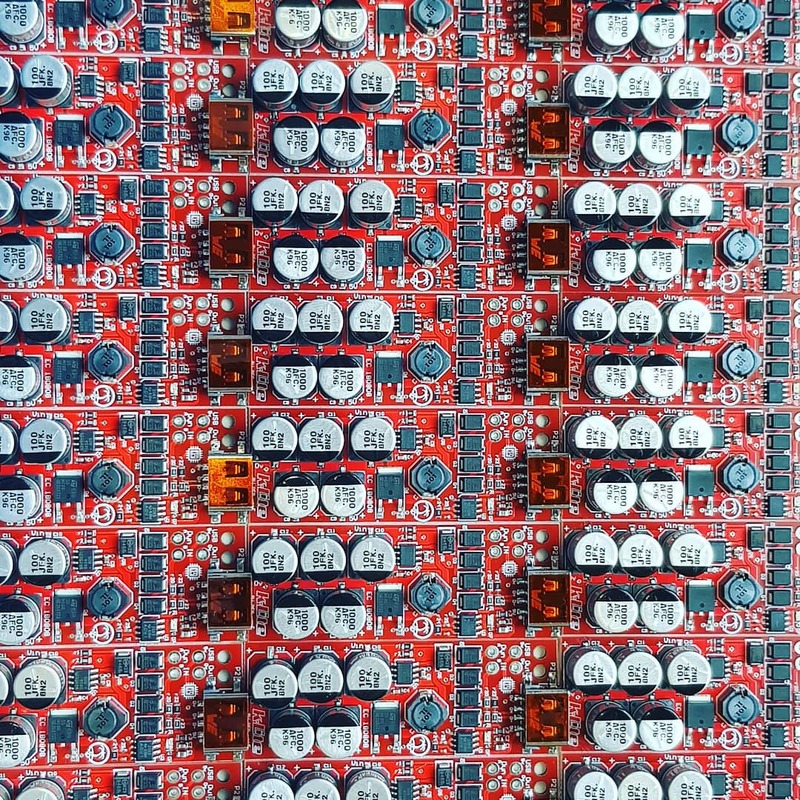 Unlike Phones, GPSes power demands are quite small and the effect on the light itself is minimal. The system available to the man on the street uses a simple toggle, lights or charging. keeping it simple. 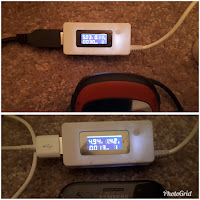 See the picture to the right to see the difference between the load from an Extrex 20 GPX vs a Samsung A5, with a medium sized battery. A new run of the USB chargers. The design of the K-Lite USB charger really impressed me. Both the input and output cables went into the same end of the unit, which means it takes up less room, and there is less kinking of cables if it is stuffed into a Gas-tank. Kerry says this set-up is designed specifically for use with the BikeBagDude Gas tank. The fit of the "USB-in" port was very tight, which is great, to stop any water egress. 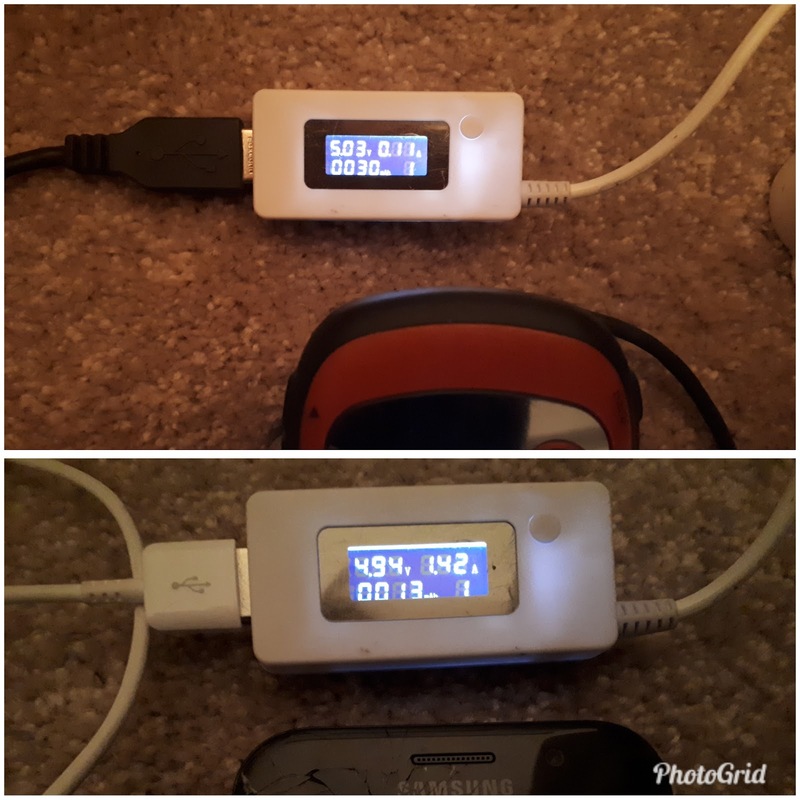 An even better surprise came later when I saw the next iteration of the USB charger, it was transparent, so you could see all the techie internals, and best of all, an activity light, so you KNOW if the charger is receiving power from the hub. Imagine how much help that will be if you suddenly lose charging power in the boonies and you are trying to trouble-shoot a fault in your hub, wiring loom, USB charger, USB cable, or actual device. If the light in the USB charger is going, you have just ruled out 3 separate points of failure. 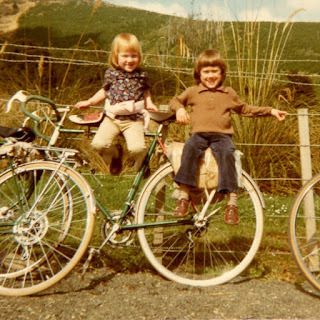 It's been tested running under water as well, so it would have been a godsend in this years Tour Aotearoa. So there are two different lights, both designs share the same housing, but have completely different characteristics. 1. MTB/Snow version, 2 wide optics on each side with a spot in the middle. 2. Gravel/Road version, 2 spot optics on each side with a flood in the middle. The side optics light up first, and the middle optic chimes in at higher speed. 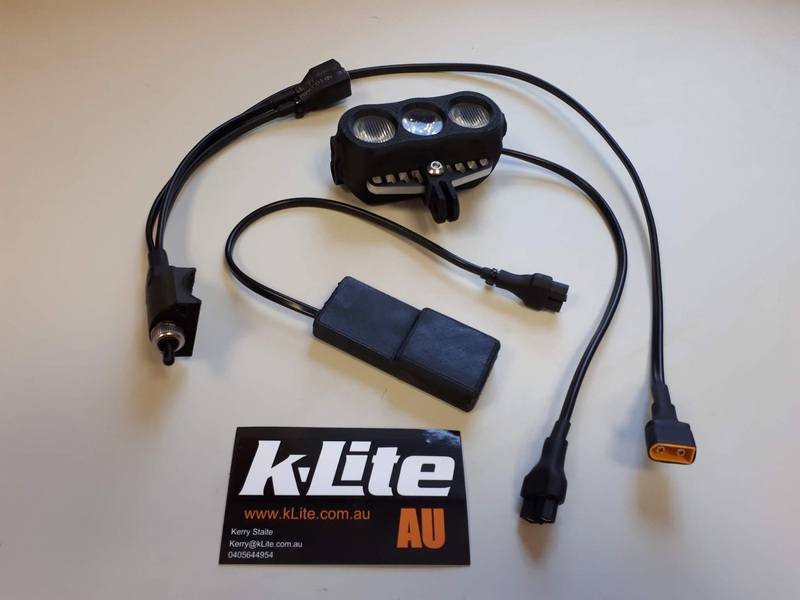 These new lights are a completely different beast from the old K-lite, the stand-light is now included into the casing rather than being a separate unit as it was in Kerry's first generation designs. This simplifies the set-up a lot. 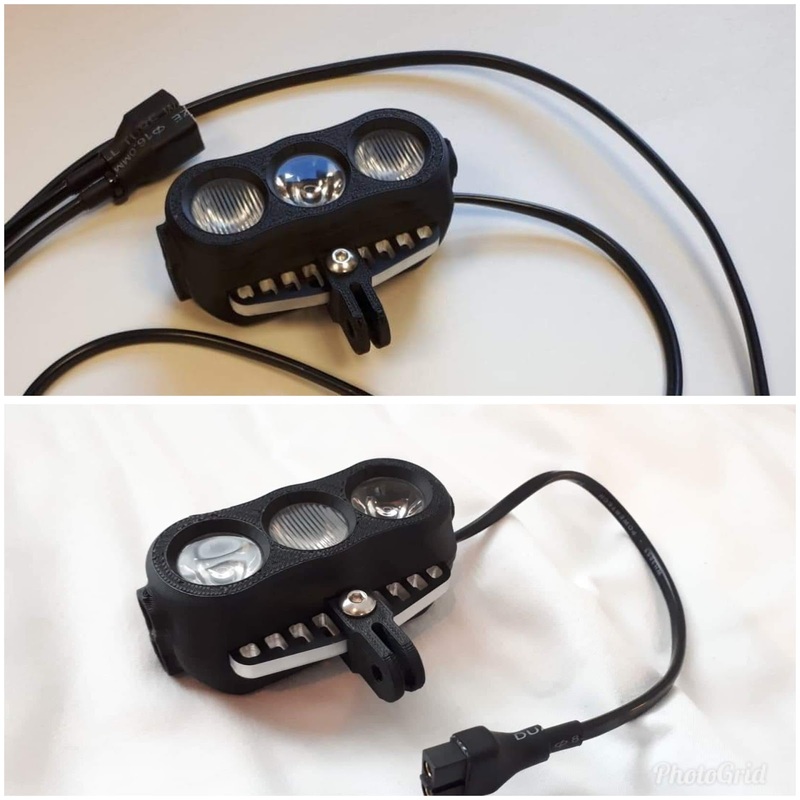 The stand-light is now as good or better than the Exposure Revolution which I always thought of as the best off road stand-light. Another thing that stands out for me are the mounting options. 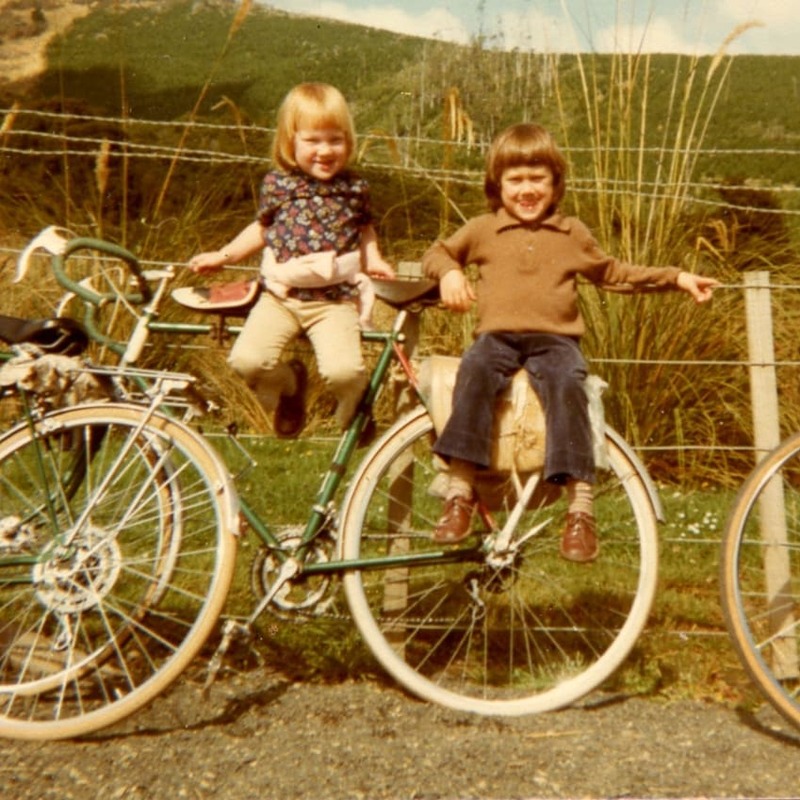 Kerry has opted to go with a GoPro styled mount because it is so widely available. There are a heap of cheapie variations of it on Ali-express with all manner of extenders to create a solution to fit around the way you distribute your front baggage. There are some incredibly creative set-ups being used, and by creative I mean that in a very "Fredly" way. The nature of the mount means that it can be removed, and the light can be mounted off a fork brake hole as well, so it is adaptable. There are also a bunch of slots in the front of the design so that if there was a bike vs Wombat experience which lead to damage then it should be possible to zip-tie the light to something in an emergency. The beam of the MTB/Snow version is basically a solid 180 degree wall of light. It is completely even in its spread from one side to the other, and only gets a lot brighter in the middle at higher speeds. 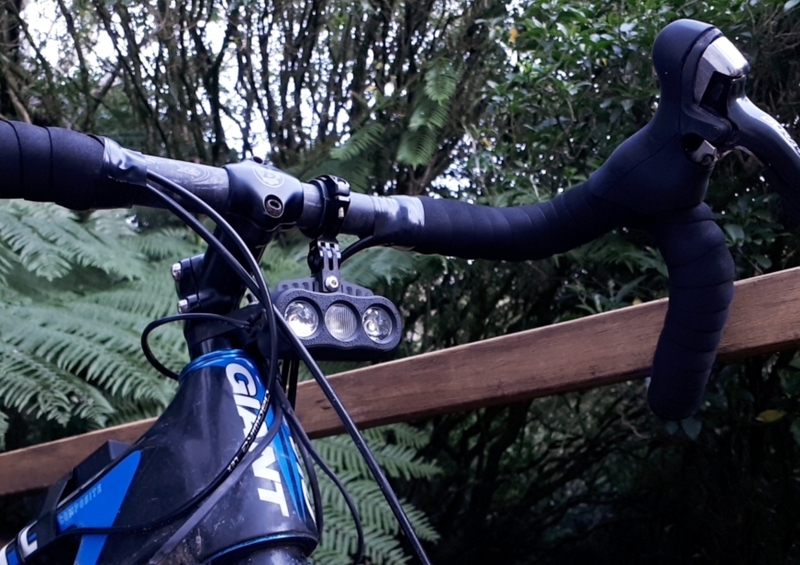 An issue with Endurance riding at night is when a centre-weighted beam pattern causes disturbance with your eyes when you have to look away from the centre of the trail. An even spread of light is much easier on the brain when everything is running on auto-pilot. Kerry maintains that in single-track, the wider beam pattern means that there is less need for a supplementary helmet light to "fill-in" the spaces when you are typically trying to see what is coming around the corner. In my experience this is true, the light was illuminating well up the sides of the trail when I was single-tracking. It can be difficult to compare one light with another. You need to make sure that both lights are pointing in the way that maximises their potential. I was using my Exposure Revo as a standard that I knew and was familiar with as a benchmark. It has a completely different beam pattern with a much more centre-weighted bias. By comparison, the K-Lite MTB/Snow version looked weaker in the middle. But this is to be expected. The Revo did not have the spread of the K-Lite out wide. You cant have it both ways. The K-Lite MTB is designed for off-roading with emphasis on a wide consistent beam. The Exposure Revo is a more generalist light with a foot in both camps. The road gravel version just blew me away out of the box. I installed the Revo and K-Lite side by side and did runs up around my block. I could toggle from one light to another and the difference was very noticeable. The Road/Gravel K-Lite was more like a helmet light with its more grunty centre-weighted beam pattern. Bright, but still quite wide. Obviously not as wide as the MTB/Snow version, but still way wider and substantially brighter than my Revo. It was so much brighter than the Revo that I was a bit gutted to be honest. The K-Lite wasn't mine, and I wished it was. A couple of weekends later Matt and I left late and did a 170 km gravel loop so we could see how the K-Lite stood up, without competition from the light pollution that you get from riding in urban areas. 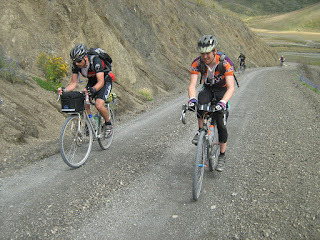 This time he was using the Road/Gravel version that I picked up when I was in Melbourne a week earlier. We finished the ride at midnight so probably half the ride was in total darkness, on quiet unlit country roads, or rugged coastline. 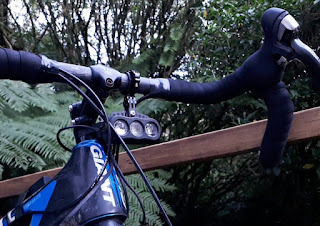 I took a spare head-lamp as there are always sections of sand, scree and stream crossings that require walking on the Turakirae Heads part of the ride. K-lite peeking out under the Aeroe front bag. On the flat sealed road sections of the ride, the difference between the Revo and the K-lite seemed less than I had observed previously. I soon realised this was because the K-Lite was partly obscured by the prototype Aeroe front bag that Matt was running. Even though the bag was hanging over the top of the lights, it still had a massive throw and reached a long way down the road. On our first decent climb in full darkness the Revo and the K-Lite seemed to be poking out a similar amount of illumination at very low speeds, but the K-Lite just reached so much further when we got rolling at any kind of speed. In another more recent night ride we did, when the Aeroe bag was obscuring even more of the light, due to running the bag in the vertical position, the K-Lite was still blasting a long way down the road. Kerry really seems to have both sides of the market covered with these lights. The MTBing bikepacker who does crazy all nighters like the Tourdivide and Race to the Rock, and the ever increasing members of the #gravgrav crowd. 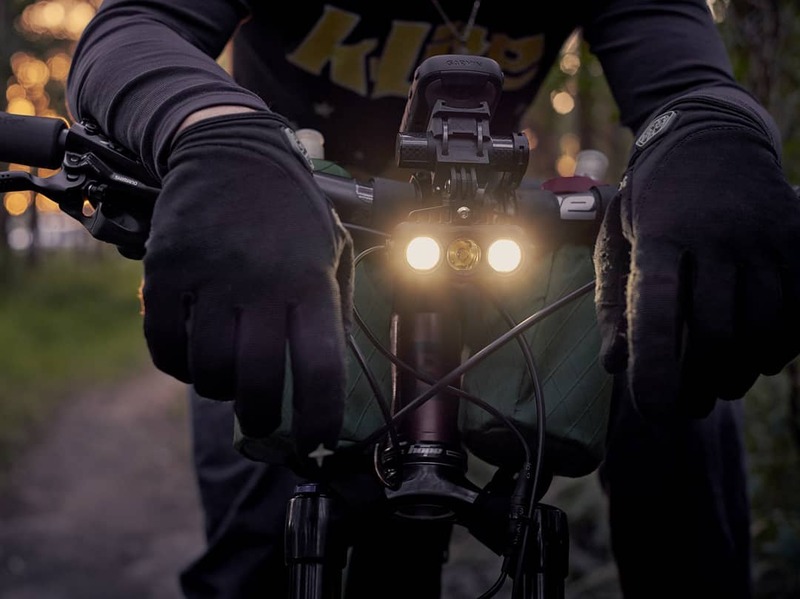 Here is a bit more info with pix about the lights from the official launch a month or so back http://www.bikepacking.com/news/klite-bikepacker-ultra/ with Kerry's video below. Anyone in NZ wanting to try the K-Lites should get in touch with the NZ rep Chris Hodder from Pure Sports. Details here. Disclaimer. These two sets of lights were lent to me on a trial basis so that a friend could evaluate them. He eventually bought a set.